I was officially challenged by both the Fitjerk and Lou Schuler to lift heavier. While it is easy to blow off the Fitjerk, (how could you not want to with a handle like that?) Lou wrote the book(s) on lifting. So applied my little brain to getting around some of the physical and logistical problems I have had with getting to heavier weights. The logistical problems are (were?) my equipment. The physical is my wrists and my fear of hurting something that would take me out of the game. Since mid-winter, my right wrist has been bothering me when I bend my hand back. I think I did something to it learning to cross country ski. I originally started doing front squats, realized that was a non-starter, and switched to back ones. I had been snuggling up under the bar from behind, but that was bending my wrists as I replaced the weight. Now I come under from the front. My only fear with that is if I over balance, the weight will roll forward onto my head. I do take some of the weight off to do cleans, my upper body just isn’t there yet. I’m pretty stoked, I went from 58 to 72 lbs already. I know, I should be lifting more weight with my lower body, but I am trying to get my upper body, especially my wrists, up to speed. I need to be able to manhandle these weights around to some extent, so I can’t be doing lower body lifts that my upper body can’t handle. 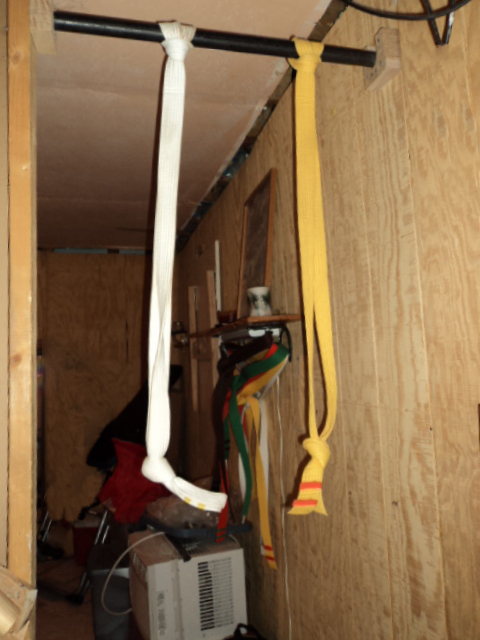 Here is my pullup bar with straps for doing hanging leg raises and a little help with those wicked wipers. 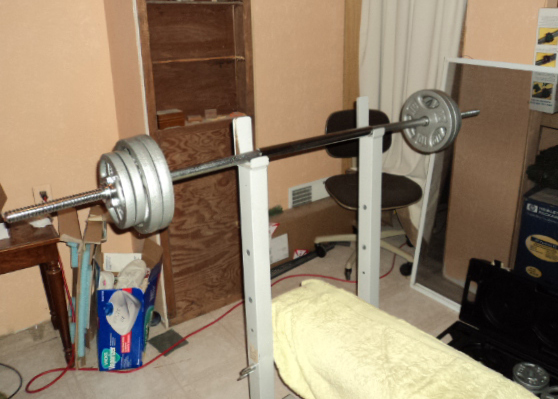 The bad news is my weight set, while stating on the box it is a “hundred pound set”, is not. I have (4)10, (6)5 and (4)2.5. The bar weighs 12 lbs. Now, I’m no math wiz, but I get 92 every time I add that up. Depending on how dedicated I am this summer, that might last me till August at the rate I am increasing at now. I’ve already made up my mind that I will join a gym this fall. I have been lusting after a squat rack anyway, and the very kind emails that Lou has sent me have made me realize how much better it would be to have some kind of training program. 3. To do 20 swiss ball pushups with my feet up on the higher part of my Bowflex – so my feet are slightly higher than my body. 4. I just added this one after seeing Charlotte’s blog- the scorpion yoga pose. It will be slightly harder to achieve these now that warm weather is here, bringing back all my other activities that were put on hold for the winter. I have every confidence that I will need to write a new list by next fall.